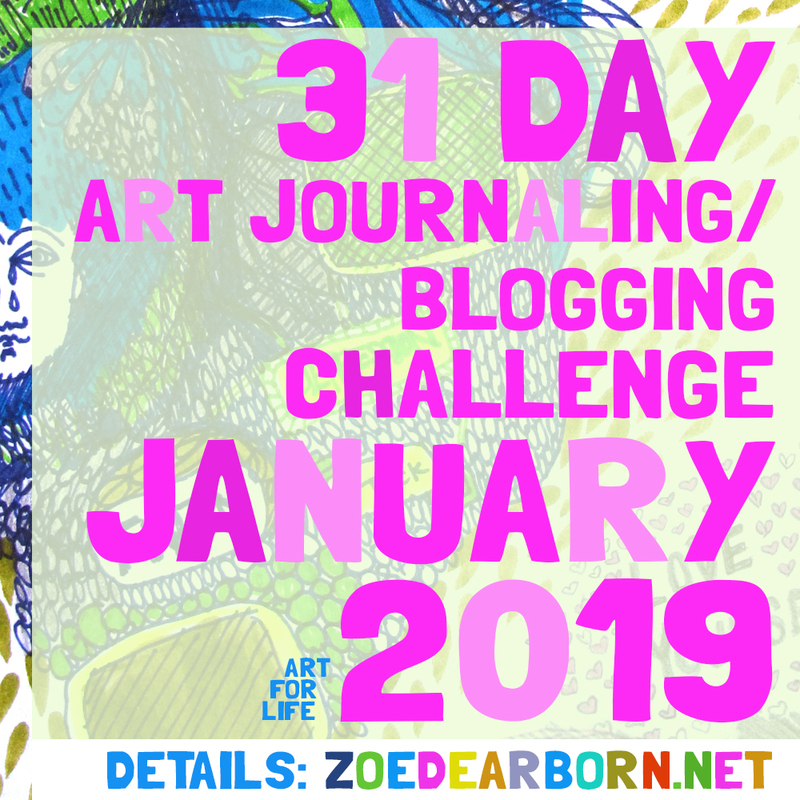 Join me on Tuesday, January 1st 2019 for my third January Art Journal Challenge! I am thrilled to be offering my Third January Art Journal Challenge. This creative challenge combines Art Journaling and Blogging. Meaning, if you choose to join this challenge, you can pick one of these daily practices, or both—alternating between the two, however you feel inclined to do it. In some cases your art journaling practice might become a digitized blog post. If you do not have a blog, but have always wanted to start one, this is a great opportunity for you to get your blog jump started. In fact, this challenge was inspired by my first blogging project, ZOELAB 365, where I committed to blogging every day for a year in order to lift myself out of postpartum depression. And let me tell you, it worked. That year was the most creatively fulfilling of my life, and planted the seeds for the many inspiring projects I am now doing out in the world. 6) A chance to win a free 90 minute coaching discovery session with Zoë! For all who complete the challenge, send Zoë an email by February 2 stating that you completed all 31 days of the challenge. The winner will be chosen at random on February 3rd. How does the 31 Day Art Journal Challenge work? 1) Sign up here. It’s $31 for the month of January. 2) Once you have signed up, you will receive an email from me with a link to the private Facebook Group. 3) Starting on January 1st, 2019! You will receive a prompt and/or creative assignment every day in the Facebook Group. If you are not a Facebook user, you can still do the challenge. The prompts & assignments can be emailed to you. However, you will not be able to participate in the group experience or receive feedback. 4) Complete the prompts either in your journal or on your computer (if you are blogging) or alternate between the digital and analogue. I recommend an 8.5 x 11 blank journal. You can order a journal like the one you see on the right, here. Use whatever supplies appeal to you. For some prompts certain supplies may be suggested. 5) Another exciting option is that you can participate in the Sketchbook Project at the Brooklyn Art Library in conjunction with this challenge. Sign up for the Sketchbook Project by January 9th, by buying a sketch book from them, which you can complete as part of this challenge. After you are done, mail your filled sketchbook for them to keep in their library, which features the largest collection of sketchbooks in the world! 5) Feel free to post your art journal pages, blog posts (from the challenge), questions, process, or anything that relates the topic of art journaling and blogging in the Facebook group. That is your space to connect with others as well as with me. I imagine everyone's reasons for joining this challenge will be varied. It may be because you want to get back into your writing and/or your art again in a daily way. 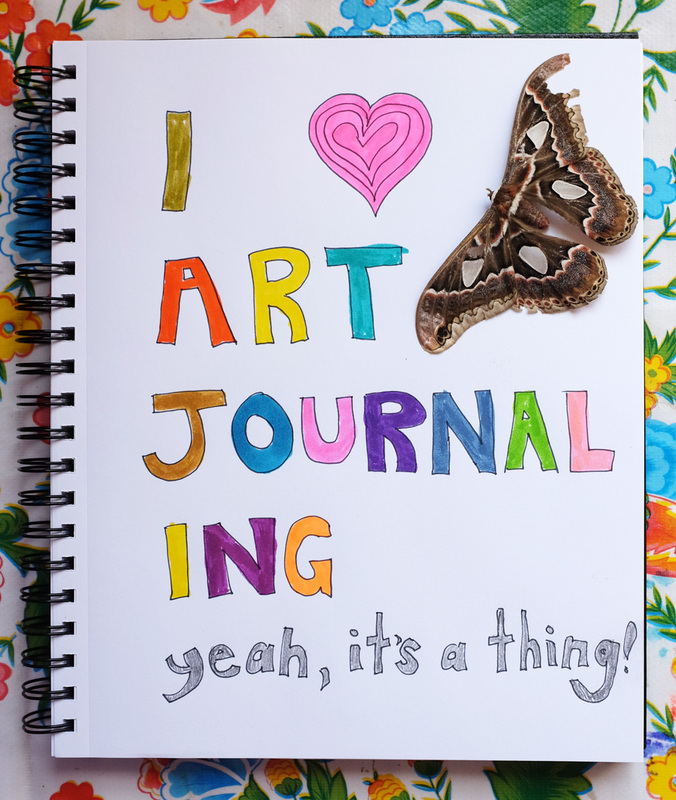 You may just be to learn about art journaling. For some, it may be an opportunity to have a quiet moment to connect with yourself. And for others, it might a wild time to experiment, with no goal other than to unleash your creativity. 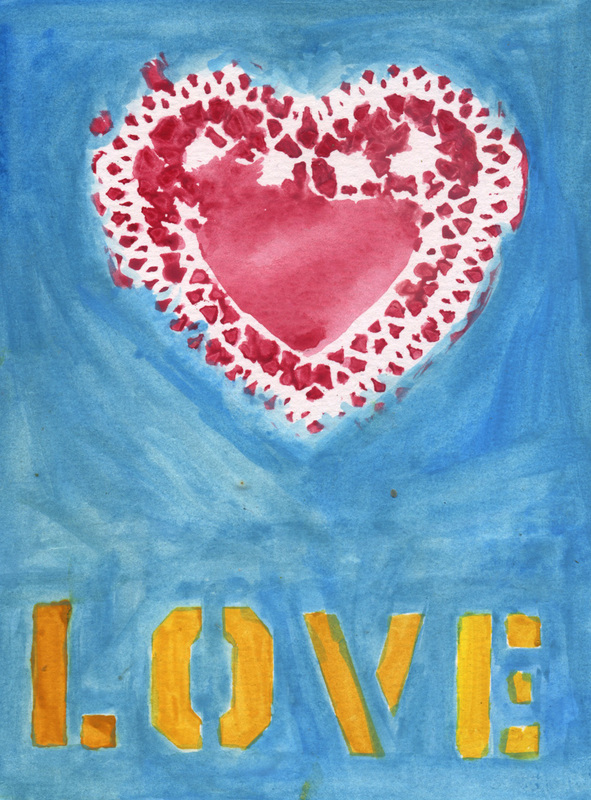 And for all of us, hopefully, it is simply a way to practice and increase self connection and love! You may discover some new reasons along the way. Art Journaling is a process that combines visual art (drawing, painting, collage, or photography) and words. Art Journaling can consist of intimate journal entries, poetry, doodling, hand lettering, free associative writing, list-making, goal-setting and planning. Putting those two aspects of our experience together on the same page: visual and verbal is the common ground for all art journaling. My version of art journaling is unique in that it combines techniques, theories, and assignments from my work as an expressive arts therapist and creativity coach. For the past six years, I have been teaching Art Journal Lab, a class that combines these techniques, in Todos Santos, Mexico, near where I live. I teach people the tools, philosophy and basic skills they need to interact with the different parts of self, which I refer to as the inner family of self. I create a structure that makes it possible to connect to the invisible parts that we feel, but don’t always acknowledge or express. You do not have to be a trained artist or serious writer to do art journaling. Anyone who can pick up a pen or pencil and has a blank book can do art journaling. There are no special supplies that are necessary, though I will be sharing some of my favorite tools during the challenge. One of my life's missions is to show how everyone is creative, and that the arts were meant to be used by all of humanity as a tool to discover the soul, and to engage in life in a more balanced, compassionate way. Through our engagement with the arts, we are able to make space for expressing the darkness, the unconscious parts of the Self, instead of acting those parts out on others. It is particularly this, this engagement with the shadow (the parts of us we do not see or do now want to see, or feel) that is the creative gold of this work. When we have the courage to bring our light of consciousness to our own shadow, we are able to unearth our previously buried psychic energy so we can make use of even our darkest pain. As many of us know, the reasons and ways to blog can vary greatly. It can be a tool to promote business, a way to keep track of your travels or other kinds of adventures, or a way to promote and share your creative work, political ideas, or simply to connect with your inner life. Whether it is for your business, for personal, or political expression, I believe a successful blog always stems from personal truth. If your business or your politics has no degree of personal connection for you, then perhaps you already have a great topic to or journal or blog about why this is so. The most difficult and most important part of what it means to blog, or even journal, is that it is regular. It is also, as many bloggers will attest, the key to success. (Success = getting readers to read your blog.) From my experiences with daily practices, which is something I promote in my art journal lab class, as well as personally, I have come to believe in the amazing power of creating a daily practice, especially something that helps you connect with yourself, with the invisible world, feelings and other parts of us that we usually work hard to avoid, push down or unconsciously act out on others. These types of inward-directed daily practices keep us holistically healthy because they keep us connected to something true and deep in us. These kinds of daily practices have helped me out depression, anxiety, a sense of loss, relationship issues, and more. They have helped me enormously with my creativity as an artist and as a mom and human being—when you do something daily, it forces you to be more creative with it—otherwise you get bored. We tend to look for new ways, new approaches when we know we have to do it everyday. To share words and images (hopefully self-generated) online about any topic, as long as it has has meaning or importance to you personally. One additional other feature: it must be dated for it to be a blog post, otherwise it is just a webpage. The date makes it time-connected, and therefore, applicable to a certain moment of time for you. This is the same for art journaling. I love blogging because it delivers a sense of immediacy that appeals to the performer in me. Blogging is a digital performance—the act of baring a personal truth, an art piece, or just a slice of life, with others, sometimes strangers, sometimes not, brings me a certain thrill. If it doesn’t feel thrilling, a tiny bit risky, I usually don’t blog about it. For each of us the thrill will come for different reasons, in different areas. What is risky for me may not feel risky for you. And so it is very much up to you to come up with your own topics to write about. A blog post can be very simple or complex. There is no rule in this department. A blog post might simply be sharing a photograph you took that day and sharing a little caption or small story or sentence that explains it. Other times a blog post might be a highly informative piece that is designed to help and/or inside others learn a specific skill (EG: this post you are reading now.) Some blog posts have taken me 15 minutes to create, others have taken many hours. Neither is better than the other—the beauty of blogging is that it keeps going. We can’t get to hung up on our last blog post, because we are already thinking about our next one! This represents the natural flow of life. We cannot afford to get perfectionistic about our daily practices, they are designed for us to make mistakes, and to learn and grow from them, that is why they are practices. If you think of your blog or your art journaling as a practice and it will help you let go of the inner critic. The reasons I host creative challenges it to help connect people to their creativity, passion and personal truth. Doing something every day creates a new habit that is affirming and helps you grow--expanding your sense of authentic self that you bring into the world. It is most certainly a challenge to do something everyday with out fail. But it is also very rewarding, and the sense of accomplishment from completing a whole month with a daily creative practice is a real thrill. I can't wait to see what it might do for you!